Fourteen years to the day after my first Love and Rockets concert! I decided to make a full vacation of my trip to Los Angeles, and be a Hollywood über-tourist during the day, and a rock fan at night. Well, at least this night. 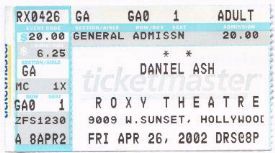 Three weeks before this one, I got to hear another of Danny's shows - from Jacksonville, Florida - through the internet. I had to wait for a long time before the show came on. Unfortunately, it sounded like it wasn't a very good night for Danny. Before I left for Los Angeles, I told myself that nothing interesting was going to happen, and that Danny wouldn't even remember me from the previous month. I'd end up just seeing another concert, then have to go back to the hotel right after. I even said this to other people, who told me I was wrong, but I insisted. I said that in the intervening time, Danny had been to lots of places, and seen lots of new people. Why should he remember me? Again, I was trying not to get my hopes up. Again, I shouldn't have listened to myself. The very first thing I did in LA, (after I checked into my hotel), was to walk up to Sunset Blvd. 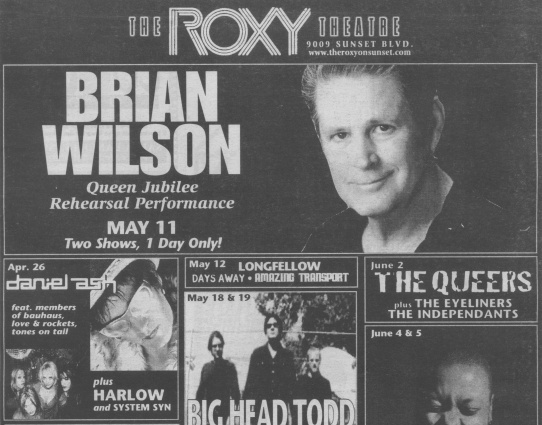 and the Roxy, where Danny's show was going to be in two days. I saw the poster for the show hanging outside the venue, and got terribly excited. At the very least, I was going to see a favourite artist of mine, at a famous venue! Encore - Coming Down Fast/Ok This Is The Pops/Go! I got to the Roxy in the middle of the first act, System Syn. They were all right, but more style than substance. The next act, Harlow were really very good. Turns out, the singer is an English woman, who was in a band in the UK (Fluffy), that I had heard of through the British music papers. I wasn't able to get up to the stage, but I wasn't too far away. Before Danny came out, I started talking to this nice guy, named Kyle, who said something about him remixing something for Danny. I didn't know whether I should believe him, but figured it was possible. I told him I had come over 2500 miles for this show. All night, he made sure I could see Danny. Even told someone who had moved into my line of vision, to move over a bit! And it did. 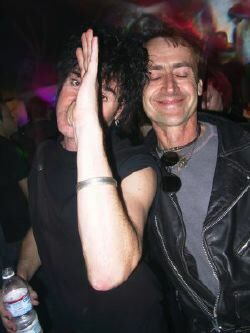 It was named Kevin Haskins, Danny's former Love and Rockets bandmate. (Actually, there was a rumour in the local press that someone special would be at the show.) A few songs into the show, some tall guy, with a woman in a furry coat and a tiara, pushed his way through the crowd, to very close to the stage. I didn't recognise him, and thought he was terribly rude. Then Danny acknowledged him, and I realised that it was Kevin. When Danny was ready to play "Go!" Kevin was onstage, pretending to sweep the stage. Then the two of them played around during the song. Danny put his shades on Kevin. Kevin was pretending to play guitar, while Danny stood behind him. They had a lot of fun together. Before one of Danny's songs, (I think it was "Mirror People", but it could have been "Sweet FA"), he started playing "No New Tale To Tell". Then he stopped, and went into the song he was really playing. This show was really wonderful, but bittersweet, being the last of the tour. Danny didn't come out to the fans after this one. He went to an upstairs area, and people had to have a wristband to get up there. I realised too late, that his manager Chris, was passing them out by the doorway to the stairs leading up there. And, eventually, the Roxy's security were clearing people out of the place who weren't going up. But I was determined to stay around until I saw Danny. When a security guy tried to make me leave, I took advantage of the fact that I had been looking upset, and talked him into letting me stay. Finally, after a long wait, I saw Danny come downstairs. I went up to him, all prepared to have to remind him of who I was. He instantly recognised me, and gave me a huge hug! I was shocked, and still started asking him if remembered me. He interrupted me, (I felt a bit foolish then), and told me he was going to this place called Cherry. He said it was "a glam club". That sounded great to me. But how to get there? I finally found Kyle, and asked him about going with him. He was going with some other people, including S, the woman I spoke to earlier. The driver was a former roommate of Danny's, named Chris. I was with people who really know Danny! When we got to Cherry, the bar was ready to close, so we got in for free. Danny was already there. He was dancing. I watched the dance floor a little, then I retreated to the bar in the other room. At one point, the DJ at the club played Love and Rockets' "So Alive". Kevin tried to get Danny back on the dance floor for it, but couldn't. Eventually, around 3 AM, it was time to close the club. The crowd was told to leave, (not too politely), and I found myself outside, trying to say goodbye to Danny. I felt like I had a thousand things I wanted to say, but I knew I only had a minute or two to say them. My brain just doesn't work that way! But I did manage to ask him what he was going to be doing in the future. He said something about doing more shows in about three months' time, (although, that didn't happen). After we left Cherry, I thought that was the end of the night. I expected someone to ask me where I was staying, so they could drop me off there. But several of the others started talking about going somewhere else. When I asked where we were going, they said "Daniel's!". (Someone was sure Danny had invited us over that night.) I made a joke about being kidnapped, and added that they could kidnap me anytime they wanted to, if they would take me places like Danny's. So, after we failed in trying to buy a bottle of something to drink, (just trying to be polite guests! ), we drove to Danny's. Danny's place was in downtown LA. There's two (could be three) trees outside on the sidewalk, next to the building, in containers. I was told that when he left the old place he shared with Chris, Danny didn't want to leave his trees behind, (that I think he had recently planted or something), so he took them with him. He wasn't home when we got there, so we decided to wait for him. Danny was surprised to see us outside his place, around 3:45 AM, when he pulled up with a woman. At first, it was awkward, because no one seemed to know who she was, and we thought we were interrupting something. (And I was terribly embarrassed seeing him again, because I really made a fool of myself outside Cherry saying goodbye - on top of what I had done inside the club! I told him my kidnapping joke, then tried to blend into the background.) But he introduced this woman as his best friend's wife, and said that they were just platonic friends. However, whoever thought he had invited us over that night, was wrong. Rats!!! Danny was so sweet and apologetic. The poor guy! He felt bad about not being able to have us inside for a visit, especially since we'd been sitting out there for a while waiting for him. He said he was really tired, and he had to get up at 9 AM, to go to the Coachella festival. (I hope he got up in time!) He also apologized for not having anything in the house to offer us to drink (we thought maybe he wouldn't have anything). Danny did invite us in for a coffee, but also said he was probably going to be asleep in 10 minutes. He also invited us to crash at his place (and I was so tempted to take him up on that offer, but no one else wanted to, so I didn't say anything. Although, I would have looked rather scary after some sleep, with my messed-up hair and smeared make-up.) Hey, they could go back to visit any other day - for me, this was probably a once-in-a-lifetime-event! Linda asked me to go inside with her, while everyone else stayed outside. I couldn't imagine why. (Turned out, she just wanted to talk to me about something.) Just before we got to the door, I asked, not quite believing where I was, "This is Daniel's?" She reminded me to breathe. (Actually, I wasn't quite as star-struck as she apparently thought I was - I've been around famous athletes for years, so I'm a bit jaded about celebrity.) I felt a bit funny being inside his place without him being there, so I stayed near the front door - no self-guided tour for me. But I did have a quick glance around. I remember it wasn't too neat in there. I think there was a feather boa (maybe a pink one), draped over something. I definitely noticed that he had his two bikes inside - the red Harley he said he was riding to Coachella, and the black Triumph. Linda and I only stayed inside a few minutes. Something she said made me think of giving him my email address. But, she reminded me that he's not too good with computers, so I didn't. We walked back outside, with our arms around each other, (also her idea), discussing my favourite tracks on the current album, (which are Lights Out, and Walk on the Moon.) She was such a nice person! S said on the way home, that Danny said to her (talking about Coachella), "I'm going to be a teenager again! I'm 56 years old, and I'm going to be a teenager this weekend!" He also told S, that if he could get music out of his system, he could become an ordinary person. (Sorry, I don't remember the exact quote.) I overheard part of his comments to S - he really didn't sound too happy. At this point, it was after 4 AM, and I was beginning to freeze, since I wasn't wearing a jacket. So, I broke up Danny's conversation with S, since she had to get into the vehicle before me. Then I got a last hug from Danny, which knocked off the backing to one of my earrings, (no big deal - that happens a lot with those earrings! ), and we left. When I finally got into bed around 6 AM, I wondered if I'd ever get to sleep. I never did get that drink Danny promised me back in Columbus, Ohio. Maybe next time. Copyright © 2002, 2003, 2006 Vivian Campbell. All rights reserved.